Teach Welsh contains three whole class MFL activities for introducing target Welsh prior to playing the games. 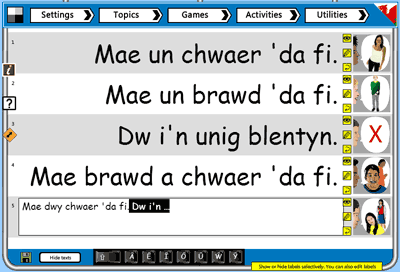 These teaching activities are designed to be both fun and motivating for your Welsh learners, and can be used in a variety of ways to stimulate and enthuse your MFL students. To try any of these activities and for more info on how to use them, click an activity below. To access an activity simply click on the Activities sign at the top of the interface. If there are custom label texts available for your selected topic, you will be offered the chance to use the custom labels rather than the default labels when you leave the settings page. Introducing the language has flashcards, annotation tools and on-screen keyboards. 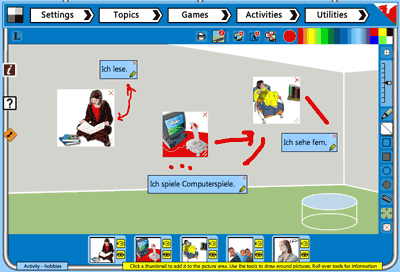 Use it to introduce new target language, to review language, to play simple games, etc. The picture mixer combines tools for adding and grouping topic pictures and texts with annotation and background images.